"The biggest lesson I've learned during my four years at Miami has been balance. Succeeding academically and simply enjoying life as a college student are best when they go together." "Hi! I'm Carrie Gomez. My four years at Miami have been a story of one amazing opportunity right after another. I came to Miami University because I hoped to find an environment with the benefits of a large university with the personal attention of a small school. I wanted to find a place where I could pursue my academic interests but not get lost in the crowd. I don't think I could have made a better choice! "I started out my freshman year knowing that I was interested in the sciences, languages, and traveling, but I wasn't certain that medicine was for me. I didn't think it was possible to incorporate all of my interests into one career path, but my time at Miami proved otherwise. "I took an EMT course to get more exposure to the healthcare field. I did undergraduate research in the Department of Zoology for three years in a lab studying retina regeneration. 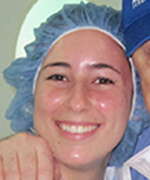 I spent a summer in Venezuela shadowing a cardiologist and pediatrician. I did a Summer Project with Campus Crusade for Christ in Costa Rica where I learned to share my faith and do ministry with college students. 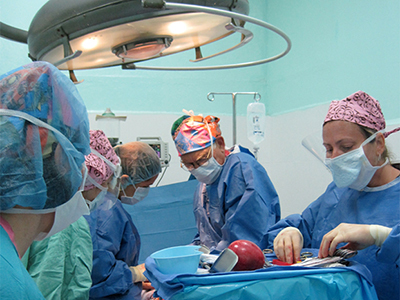 A team of surgeons and nurses operates on a patient in El Salvador. "In the fall semester of my senior year, I had an amazing opportunity to travel to El Salvador with a team of doctors, nurses, and translators from the organization Medical Hands for Healing. This opportunity was provided through the Mallory-Wilson Center for Healthcare Education by the generosity of Dr. James Bertz, a maxillofacial surgeon who is a Miami alumnus. I submitted an application to the Center early in the fall of 2009 and was fortunate enough to be chosen to accompany Dr. Bertz on this incredible trip. "We spent a week at San Juan de Dios Hospital in the city Santa Ana doing dozens of surgeries that these Salvadorans would likely not have had access to otherwise. I was able to work in the instrument room to help with the preparations for the surgeries and I even did some translation. Whenever I had a few spare moments I could go into an operating room and watch a surgery taking place. The trip was not without challenges—we worked long hours and even got stuck in Hurricane Ida! "The biggest lesson I've learned during my four years at Miami has been balance. Succeeding academically and simply enjoying life as a college student are best when they go together. I love that Miami has been a place for me to grow in my faith, incorporate all of my passions and talents, and have once-in-a lifetime experiences like traveling abroad."